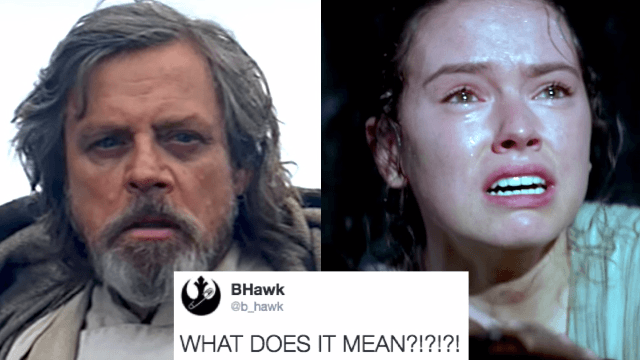 The foreign language translations of the next 'Star Wars' movie's title reveal a huge hint. Speculative spoilers below. Don't read if you're worried you'll get speculatively angry. Star Wars fans still have to wait until December 15 to see the franchise's next installment, The Last Jedi. But despite Disney's total crackdown on spoilers, the hype train shows no signs of slowing down. Nerds are latching onto any hint they possibly can to figure out what might happen in Episode VIII, and now they've got a big one. After the title of The Last Jedi was announced in January, fans immediately started speculating. Who is the last Jedi? Luke? Rey? That buttface guy from A New Hope? Until now, there was no clue. But on Friday, Star Wars Twitter accounts in other languages shared the official translations of The Last Jedi for the first time. And due to the "Force" of linguistics, we now have some very interesting information about what it really means. Fan immediately started freaking out. And it's not just in Spanish. Fans who speak other languages that pluralize definite articles confirmed it. This should come as a relief to all the geeks who worried that the title implied Luke was going to die. He still could definitely die, but some of the pressure is off. Yes, we figured it out. The Ewoks are all Jedi. You're welcome.